The cause of erosive pustular dermatosis of the scalp is unknown. However, it appears to relate to sun damage and is possibly triggered by a minor injury to the affected skin (including a surgical procedure). Infection is not thought to be the primary cause, as the lesions do not clear with antibiotics alone. The crusting should be removed by gentle soaking, perhaps using dilute vinegar as antiseptic astringent. 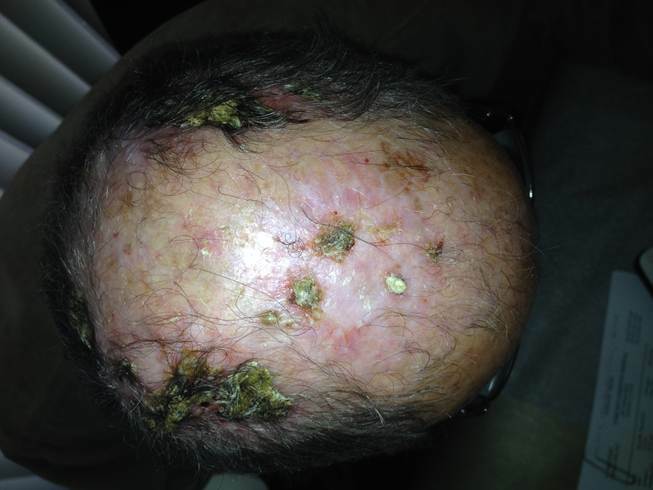 Erosive pustular dermatosis of the scalp improves with potent or ultrapotent topical steroids applied once or twice daily to the affected areas for a couple of weeks, then repeated as necessary if and when the skin disorder recurs. Patients with erosive pustular dermatosis of the scalp should see their medical practitioner or dermatologist regularly. New solar keratoses and skin cancers may arise in the affected areas and should be treated promptly. They may be difficult to distinguish from erosive pustular dermatosis of the scalp, so biopsies may be necessary.